Colonel Sun by Robert Markham is the first novel featuring secret agent James Bond, 007, not written by Ian Fleming. Robert Markham is actually the pseudonym of Kingsley Amis, the book was published six years after the death of Ian Fleming. In today’s world where some authors became simple brands which publishers build on, it is not uncommon to see a book which uses an author’s name and brand for a new story by a different writer. 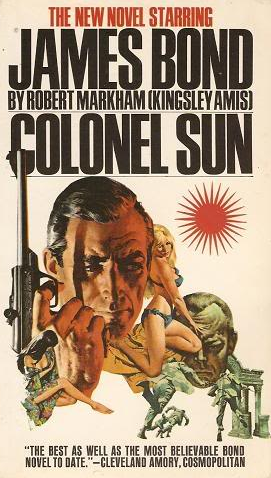 Colonel Sun by Robert Markham came out in 1968, a few years after Mr. Fleming’s death and many years before successful books, authors, and characters were branded as a franchise. The book itself is strangely written. It seems the author was trying to write in the same vain as Mr. Fleming in the beginning as a fast paced thriller, only to give up somewhere in the around quarter way and write in his own style turning the thriller into an traveling adventure story. That is not bad, just makes for a strange reading experience. I couldn’t help but notice that this is not Fleming’s Bond. We find a Bond who is unsure of himself, nervous, has more conscious which seemed to have been traded for less affinity for the good things in life which he was known for. The characters in this book are not very memorable, but I thought the story was good and Colonel Sun, the villain was just the right amount of nasty, I just wish he was in more of the book. Not a particularly engaging book but still worth the read especially for Bond fans or just for those interested on how the Cold War was viewed in 1968. The head of MI6, the British Secret Service, otherwise known as M to Bond fans has been kidnapped right under 007’s nose. Realizing this is a trap, Bond walks right into it at the Aegean Islands. Bond discovers that Colon Sun, of China’s People’s Liberation Army, is bound on sabotaging a Middle East détente conference which the Soviet Union is hosting. Dis­claimer: I borrowed this book from the library.